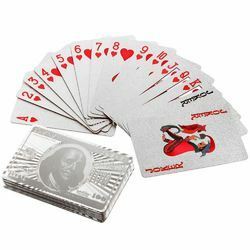 Depending upon your choice of design, colour, shape and size, we can manufacture custom designed Bespoke playing cards for you. We can accept large quantity orders of 1 million decks and ship the same withing 4 weeks from approval of the artworks. Crisp images printed on state of the art Heidelberg machines are our forte. Manufactured by the United States Playing Card Company and branded by Bicycle, these cards are made from 100 percent cellulose acetate plastic, the same process and same manufacturer used to produce KEM cards. Personalized Playing Cards "My Cards"
These are silver plated playing cards especially for the major corporates sectors. We are manufacturing PVC Semi Rigid Sheet for making playing cards (0.30 mm), approved by M/s Sheel Son, Delhi, leading dealer of playing cards. 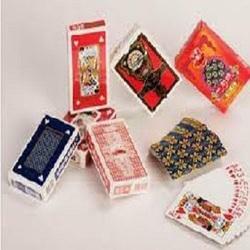 We are engaged in manufacturer and exporting of quality array of Playing Cards. Crafted from black centerboards, art cards, white back boards, these playing cards are designed in clear multicolored prints. Available in different gsm such as 250, 270 and 300, these cards can be customized in terms of design and pattern.we are also supplying in domestic & international market.